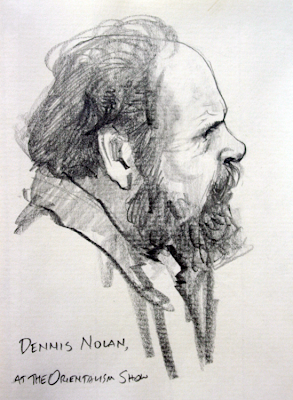 Meet my friend Dennis Nolan, professor at the Hartford Art School. He wants to change the way you think about art history. 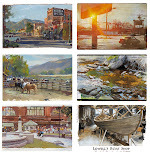 Dennis offers his students a solid grounding in fundamentals: animal and human anatomy, composition, color, and perspective, very much in keeping with the way art has been taught for centuries. He earned a BA in art history and an MA in painting at San Jose State University, and has illustrated and written many books. A few years ago I sketched his portrait. More on his bio here. I also painted his likeness in the middle of the title page of Dinotopia: Journey to Chandara because I think he is a very important figure in the art cosmos. On October 9 I’ll be visiting him and his students, so keep an eye on this blog. A couple years ago, Dennis described to me a new way of diagramming the course of art history. This in itself is nothing new. Others have drawn charts to show how one movement of art led to another. For example here’s a diagram from an exhibition catalog of 20th century painting, emphasizing the years between 1905 and 1925. Here’s another drawing, by Ad Reinhart, presented in the form of a tree, with all the abstract and conceptual artists on the healthy left side of the tree (click on the image to enlarge). The representational or narrative artists are on the right, dragging down the rotten limbs, with “corn” like Norman Rockwell growing from the dung. These two charts are both unecessarily complicated. They can be boiled down to the simple analysis that is fed to countless undergraduates. It’s such a familiar account that we almost take it for granted. Artists from Van Eyck to David went on for centuries using pictures to tell stories. This eventually led up to the mid-19th Century when Academic artists grew old and stale and irrelevant. Then there was a complete break starting in the 1860s. First the Impressionists and then the Post-Impressionists led the “art for art’s sake” movement that went through the familiar steps to modern and contemporary art. The problem with this analysis is that it doesn’t take into consideration the forms of art that real people—like your great grandparents and my great grandparents—were excited about, namely illustration, comic art, and animation. In art history courses we never heard about these forms, nor about the artists who told stories with pictures. It’s as if narrative art vanished from the face of the earth. But it didn’t disappear in the 20th Century. Like jazz and rock and roll, it flourished. Dennis’s diagram puts the storytelling forms squarely in the center of the mainstream history of art, where they directly inherit the legacy of the ages. The modern movement still plays a significant, if culturally marginal, role as agent provocateur. Nolan’s view (which I’ve expanded and put into my own words here) is heretical, and for all that, immensely attractive. It make sense if you think about it. New technologies of communication were invented, and these media offered original ways for visual ideas to reach people, just as recording technologies brought the bandstand to the living room. Instead of going to the Salon or the Art Union to feast the eyes, people were getting their art from magazines or movie houses. The delivery system and the patronage shifted, but the kind of art and the role it played in people’s lives didn’t change that much. Artists seized these opportunities. Comics and animation and illustration became the art forms that pulsed with the lifeblood of the times. They still do. With digital media, the possibilities have grown even more diverse, and young artists with good training and with stories to tell have unlimited opportunities. There is no line between “fine” or “commercial” art; there is no high or low art; there is only Art, and it comes in many guises. Let’s break down the walls and cheer on the good stuff wherever we find it. Well said! I wish there were as many art teachers out there as "enlightened" as yourself and professor Nolan. I can't count even one in my art education (1st grade through college) who was encouraging of my imaginative drawing style. Thanks for the encouragement. Your friend is awesome! Unfortunately the old school of thought is still believed by many teachers concerning art. I did, however, have an Art History teacher who agreed with Professor Nolan and encouraged student to go in the direction they wanted, and encouraged people to go towards anime, comic art and manga, because as he would quote Leichtenstein who painted the famous comic series, "What is art? ", basically saying that comic and illustration art is no less a fine art form than Van Gogh or Picasso. We need more teachers like Professor Nolan! This is something I really struggle with. I was taught in an art school coming out of the predominantly abstract/conceptual tradition of the 70's as well as the writings of Greenberg. There were a handful of teachers that did have a deep respect for comic books and illustration. I love that you and Prof. Nolan giving me a simplified perspective of this struggle. It's nice to feel good about what you do. I have been teaching art for many years and always been more interested in illustration, commecials, animation, film, photo etc. then in "fine" art. I thank Johm Berger for that. He had fresh eyes on art early, so the fact that painted art slowly died and other art forms took over is a well known fact. Still the established truth is that fine art is Art and all other art is "not so fine" and not even art. Bourgeoisi Art will always be Art fore some. But for 99% of the people this fine art is nothin. Thanks Professor Nolan! You are saying the same as John Berger said 50 years ago! I hope all Art Academies will read this post. Maybe it will clear out some strange and fundamental misunderstandings about art (and creativity). Thanks for sharing. Dennis Nolan is the best. 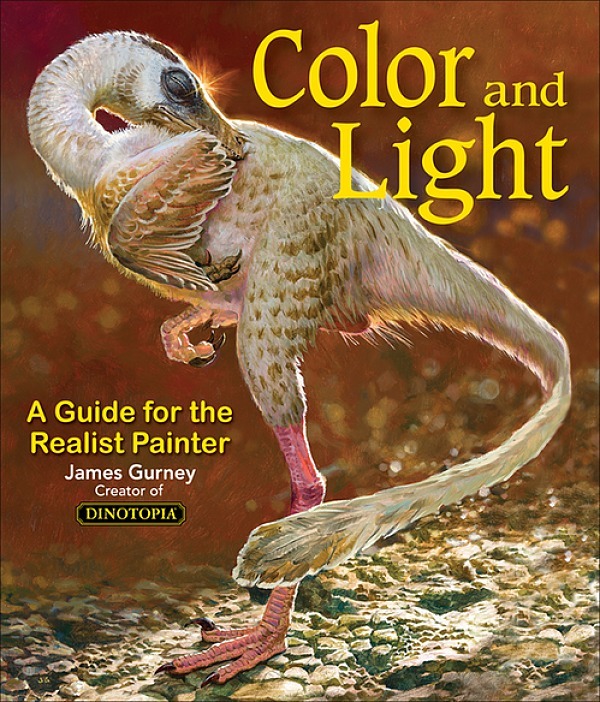 I consider myself extremely fortunate to have had him and Bunny Carter as the first set of teachers I experienced when I was enrolled in the Hartford MFA in Illustration program. Dennis is the type of professor you always wished you had in school - smart as whip, unbelievably talented, kind and encouraging.